So the project is finally done other than cleaning up the box and making it look better etc.... The big question though, is, was this project really worth it? How well does this reflow toaster actually work? This is the answer. This tutorial covers the basics of the TimerA0 capabilities including interrupt configuration. 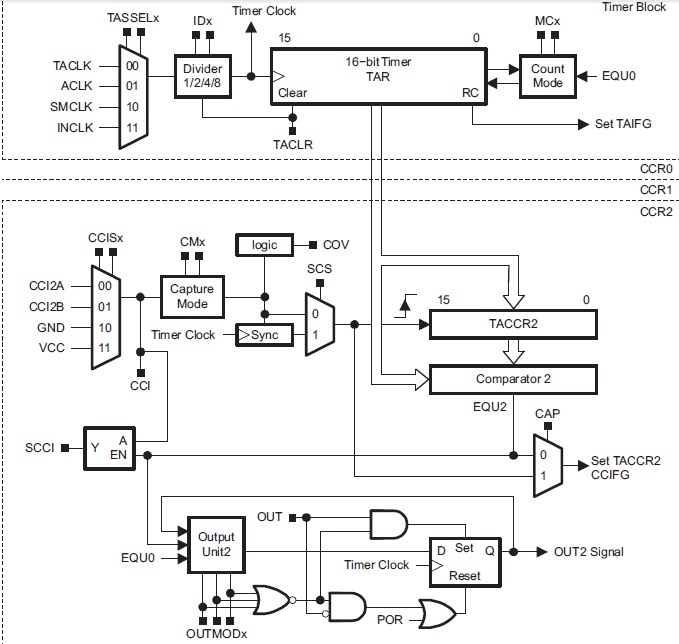 The Timer module counts clock cycles in an accumulation register called the "TAR" register. The chip I'm using (MSP430G2553) has 3x associated capture compare registers. These registers compare a set value (that they hold) to the TAR and throw an interrupt when they match. A simple way to look at this is that TimerA0 as 3x sub-modules (the capture compare registers) and all of them work together as a unit. Below is a screen shot from the datasheet. This section discusses the analog front end for all of my sensors. I had to do some signal conditioning which I'll discuss in a second. Here I discuss the power system I used for this project. It's pretty simple and short. This will be a quick write-up about how I did my integer division by 10 and a brief discussion of the main state machine that runs the overall 140-170-215 thermal profile. This (ADC10 interrupt service routine) is one of the most confusing sections. Here, I sample and do most of the math and averaging calculations regarding room temperature and thermal couple temperature. Here I discuss the details of me temperature control algorithm as well as some simple interrupt service routines I use to run my communication links (comm. links back to the GUI). Here is the system demonstration. There isn't really much to discuss in text because the video does a much better job of showing this setup in action. The profile I've developed is a ramp to 140 degrees C with a hold time of 45 seconds once we reach 140. Next, we ramp up to 170 C and hold there for 45 seconds. The last target temperature is 215 C and we hold there for 60 seconds. This last temperature is where things get interesting. Once our hold time expires the system shuts down. These profiles are completely customizable in software (embedded C code in the MSP430).